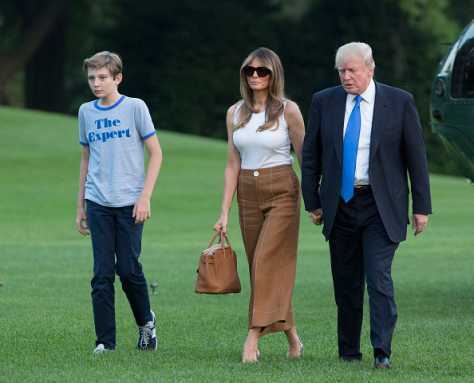 President Donald Trump’s Wife, Melania Trump and his son, Barron Trump has moved to American Presidential Villa Popularly known as “White House” after five months of his inauguration as the president of US. Earlier, some American news websites have reported Melania Trump and her son, Barron will be joining Donald Trump in white House. Yesterday, Sunday, The Donald Trump administration confirmed that Melania and her son has officially arrived to join their wife & father respectively at the White House Sunday night on the Marine One. According to reports, the duo were accompanied by President Donald Trump’s in-laws, Viktor and Amalija Knav, on Marine One from Joint Based Andrews. “Looking forward to the memories we’ll make in our new home! #Movingday” #PresidentTrump #MelaniaTrump #FirstLadyMelaniaTrump #TheWhiteHouse #FirstFamily. Today, President Donald Trump will be facing two lawsuits filed by two Democrats Attorney generals for violating US constitution.